The mural “Land, Sea, and Space” was commissioned to celebrate UNH’s 150th anniversary. The first thing you notice is the swirl of vibrant colors — red, orange, blue, green — and the larger-than-life figures, both in their design and significance to UNH, chosen to visually mark the university’s 150-year history. Created by students in professor Jennifer Moses’s intermediate painting class, “Land, Sea, and Space,” a new mural for the Dimond Library was commissioned as part of the yearlong sesquicentennial festivities that began in September. It will be officially unveiled this week. Moses’s class spent the beginning of the semester discussing possible themes for the project and conducting research on how best to artistically present UNH’s rich past. Once a consensus was reached to root the work in the university’s land-grant mission, students crafted individual designs. The one chosen is a hybrid of many of the proposals, Moses says. "So far it has been an average of 70 man-hours a week to meet our deadline." Those notable people include Lee Morin ’74, a NASA astronaut who traveled to the International Space Station; Floyd Jackson, UNH's first marine scientist and founder of the marine laboratory on Appledore Island in 1928; Edwin and Mary Scheier, mid-century modern potters who taught at UNH for 20 years; Clark Terry, professor of music and internationally renowned jazz trumpet player; Caroline A. Black, a botanist and the first female professor at UNH, and Yitang Zhang, the professor of math who recieved a 2014 MacArthur Foundation "genius grant" for his work on the twin prime conjecture. A mural is “hard to pull off,” Moses says. The painting is not done from observation but rather from the imagination, and it is highly stylized. Students took pictures and used magazine cutouts for resource materials. In class, Moses worked on issues she thought would come up during creation of the mural. A section of the mural in process. The image of renowned jazz trumpeter Clark Terry can be seen at right. 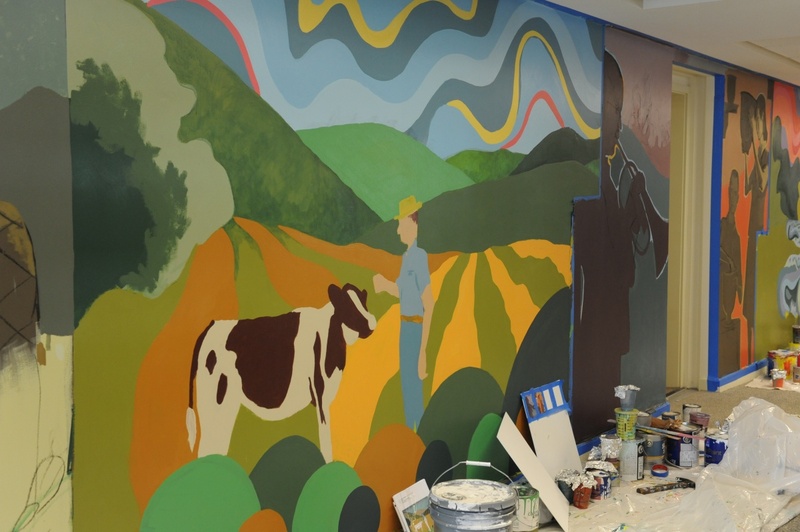 While Moses hadn’t led students through the process of creating a mural before, she notes the experience wasn’t that different from the way she teaches. “My style is more about critique. We talked about the decisions they were making, and I’d give my assessment and then let them translate that into their own sensibilities,” she says. A reception to celebrate the unveiling will take place Friday, Dec. 9, at 11 a.m., in the Natural Science Resource Center, room 201 of Dimond Library. Interested in studying art and art history at UNH? See what other students are up to.